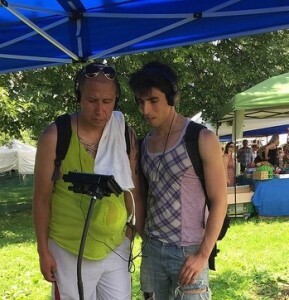 My 13 year old son and I were among the many CAA volunteers and staff working the pay-per-view table this June at the Twin Cities Pride Festival. We offered attendees one dollar to watch a short segment of the documentary, Farm to Fridge. It was a very successful event in that 540 attendees watched the video. 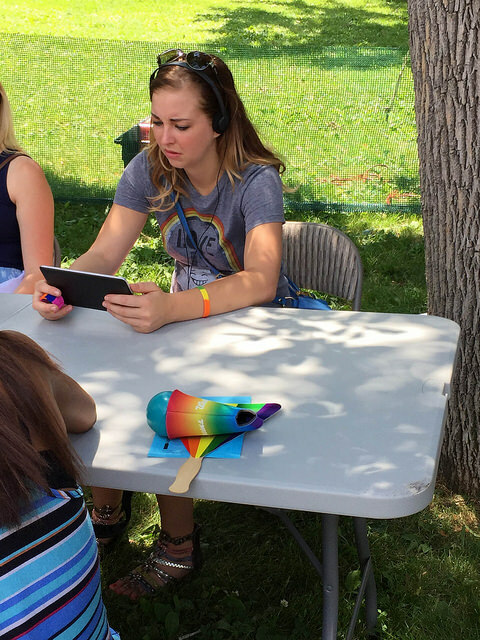 One reason we were able to reach so many people was because volunteers had multiple tablets set up for viewing, and they were continuously in use. 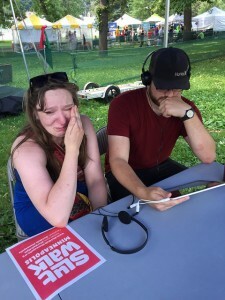 In between viewings, we had many heartfelt conversations with viewers and other attendees who were curious or wanted to learn more about the disconnect between what happens on factory farms and industry’s heavily funded efforts to manipulate the public’s understanding of factory farming. Others were eager to share that they were vegetarian or vegan too. Some people simply thanked us for what we were doing. Thanks to the work of organizations like Mercy for Animals and Last Chance for Animals, many people are now at least somewhat aware of the horrors of factory farming. At the Pride Festival, our viewers were moved to take yet another step toward personal change by watching the four-minute video. Some viewers were truly shocked by what they saw. They were visibly disgusted. Many were deeply moved and said they were ready to make changes in their own lives. About 9% of viewers refused the pay-per-view dollar. We listened to viewers articulate their reactions, and then we discussed steps they felt they could take right away. Nearly everyone agreed that Meatless Mondays would be an easy way to start putting values into action. Putting values into action is why my son and I are longtime volunteers with CAA. It brings authenticity to our own lives. For me, that’s why volunteering is such a positive, rewarding experience. My volunteering experience with CAA also “bubbles up” in unexpected ways on my own time. Recently, for instance, while checking out at the grocery store, the cashier remarked that I must like to cook since the vast bulk of my basket was fresh produce. I mentioned that we were vegan and vegetarian at our house. With that, the cashier unleashed a wave of sentiment about his own efforts to eat less meat. We chatted about that for a minute or two. I had clearly sparked something positive in him. For my willingness to start a small, but important conversation, I credit volunteering with CAA. It strengthens my values by giving me an opportunity to put them into action, and for that, I’m a better advocate for animals. We’ll also be offering pay-per-view at Twin Cities Veg Fest on November 1. 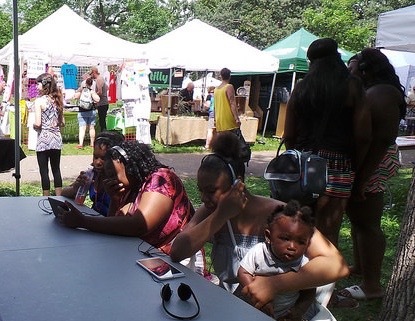 Pay-per-view at this festival is particularly effective because, in addition to seeing the video, participants have an opportunity to sample a variety of delicious vegan food. In that way, they get a very tangible experience of how they can move towards a plant-based diet to make a difference for the animals. Please consider making a donation to support Twin Cities Veg Fest today. Our crowdsourcing campaign continues just a few more days through August 24. Your support allows us to make the festival free to attend, inspiring thousands of people with a celebration of compassion.